Quarterbacks may need a solid team around them to find success, but they're still typically their team's most important pieces. 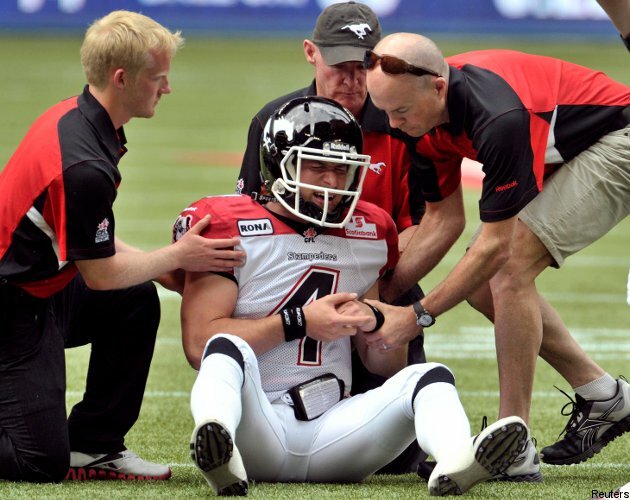 Thus, Calgary starting quarterback Drew Tate's shoulder injury midway through the first half of Saturday's game against Toronto could have significant consequences for his Stampeders, particularly if he's out for an extended period of time. Early indications are that Tate has a left shoulder injury, and it could be dislocated; that happened to him in 2011 and had him out for six weeks. Given Tate's performance to date, his loss could be a huge blow for Calgary. Tate was very good down the stretch in 2011 and started 2012 with a bang last week, outdueling Anthony Calvillo. He got off to a good showing in Saturday's game too, completing five of six passes for 64 yards and a touchdown, but then took a hit that had him quickly helped off the field. Tate went to the locker room immediately and then returned with his left arm in a sling, suggesting that he's not going to be back any time soon. If this is a dislocated shoulder, that isn't exactly a minor injury. TSN analyst Jock Climie shared his own experience with a dislocated shoulder on the halftime show, an injury he picked up playing CIS football for Queen's, and it sounded horrible. "I've never been in so much pain in my life," Climie said. "It is agony for the next two weeks or so sleeping." Tate's right-handed, so at least this isn't his throwing arm, but it's still not going to be a fun recovery for him, and dislocating the same shoulder last year could lead to further complications. That's a rough blow for the 27-year-old Tate, the youngest starting quarterback in the CFL, and a guy who looked set to really ascend to star status this season. What will Calgary do without Tate? Well, they are fortunate that they have an experienced backup in former Hamilton starter Kevin Glenn, who they landed in this offseason's trade of Henry Burris. However, don't assume that Glenn can immediately step in where Tate left off. For one thing, Glenn hasn't had a ton of reps in practice and is still adjusting to this offence; for another, he was okay but not fantastic last year with the Tiger-Cats, throwing for 3,963 yards with a 62.9 per cent completion mark, 19 touchdowns and 17 interceptions. Having someone like Glenn in a backup role is fantastic, and Glenn might be better suited to step in immediately than any other backup in the league, but that doesn't guarantee that he'll be able to perform at the level Tate was delivering. Early indications were mixed: before the half, Glenn completed an impressive seven of nine passes (77.8 per cent) for 100 yards, but he also threw a terrible momentum-killing interception that was returned a long way. We'll see which Glenn the Stampeders get going forward. In the grand scheme of this season, this may not be a major problem for the Stampeders. If Tate is out for five or six weeks, that's tough, but at least they have an experienced guy to plug in. They also have a great running back in Jon Cornish, a solid defence, a good offensive line and an impressive cast of receivers led by Nik Lewis; those factors will make any quarterback's job easier. If Tate's able to return after five or six weeks, they'll still have him for the majority of the season, and in a West Division where there are substantial concerns about every team other than B.C., that may be more than enough to earn a playoff berth. Still, this is a notable setback for Calgary, and one that's going to make their life more difficult. Just how much the difficulty will increase depends on the severity of Tate's injury and on how well Glenn plays in relief.